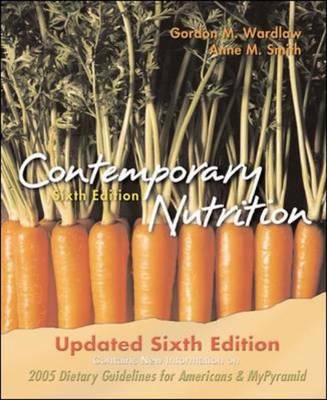 "Contemporary Nutrition Sixth Edition Update" is designed for students with little or no background in college-level biology, chemistry or physiology. Updated to include the new 2005 Dietary Guidelines & MyPyramid information, "Contemporary Nutrition" will provide students who lack a strong science background the ideal balance of reliable nutrition information and practical consumer-oriented knowledge. With his friendly writing style, Gordon Wardlaw acts as the student's personal guide to dispelling common misconceptions and to gaining a solid foundation for making informed nutrition choices.